A GP working six sessions a week with 25 interactions per session could be involved in seven to eight severe harm incidents a year. However, despite primary care accounting for around 90% of patient interactions <1% of incidents reported to the NRLS in 2015/16 came from primary care. Our hypothesis was that there was under-reporting of incidents occurring in primary care, which meant that opportunities to identify learning were being missed. Incident reporting is a barometer of safety culture, along with the other aspects highlighted by the five Sign Up to Safety pledges. Through our baseline scoping with practices, we identified that wider cultural themes of workload, engagement, and communication and some systems and processes were important factors that needed to be considered. 28 practices have received support through the two cohorts of the collaborative including one group of community pharmacies. 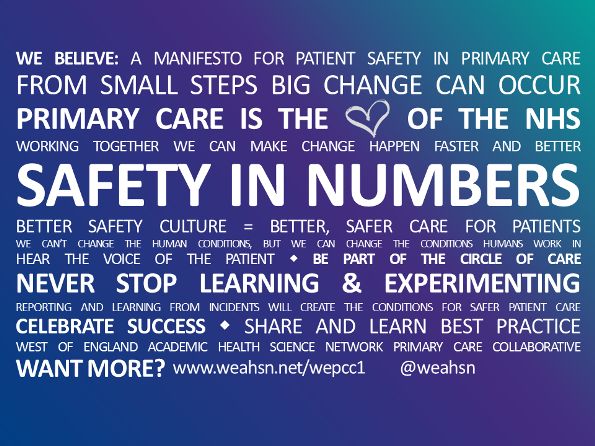 608 primary care staff have taken part in the safety culture survey across two cohorts. In evaluation, practices have reported that they have made changes to communication and team involvement because of the survey and debrief process. NRLS data on number of incidents reported by GP practices in the region show that incident reporting has nearly doubled (93% increase) between 2015/16 and 2016/17. This is compared with a national increase of 73%. The West of England region was one of the lower reporting areas to start with, but is progressing faster, albeit against a low baseline. HSJ Patient Safety Congress 2018 Poster Category winner in category “A culture for learning and change”. “At Locking Hill Surgery our involvement with the Primary Care Collaborative proved to be invaluable in enabling us to achieve a significant improvement in our CQC rating. For example, engaging with the Practice Culture Survey helped enormously by bringing into focus those areas where change was most needed. Implementation of these changes has led to new ways of working which have improved our efficiency and facilitated the ongoing process of team-building. We also were assisted in the shaping of our new practice vision, contributed to and shared by all our staff. The Practice Care Collaborative is a wonderful opportunity to share ideas within a like-minded peer group and to learn from each other in a mutually supportive and informal setting, facilitated by people who know what it is really like at the coal-face of front line General Practice. The speakers are engaging, relevant and chock-full of enthusiasm into how we can all improve the quality and safety of the care we provide by sharing our experiences and by encouraging innovative thinking. To develop a safety culture that engages with patients and staff to support the delivery of safe and reliable care in primary care teams. Reviewing the evidence identified there are several unique challenges in the primary care context which differentiates it from other healthcare and safety critical industries. Using collaborative networks for patient safety improvement is a familiar approach in the West of England region, and therefore the Patient Safety Collaborative decided to adopt this approach in the primary care setting. Each practice generally has a core team of four members: a GP lead, a nursing lead, a patient representative and a management lead. These members were invited to attend the collaborative sessions and feedback to the wider practice team including the practice leadership team. The anticipated benefit of the collaborative was initially to increase rates of incident reporting to NRLS from practices involved in the collaborative, to support the delivery of safe and reliable care. However, as described above, the focus of the collaborative changed from incident reporting to safety culture. Recruit and select practices from across the West of England AHSN region to take part in a primary care collaborative, structured in two cohorts, each cohort running from May to March. Individual practices supported to carry out a culture survey, receive a facilitated debrief and identify actions for the practice from the results, with an option to complete a follow-up survey after 12 months. Capacity building of knowledge and skills through practice visits with support as appropriate from the Patient Safety Team. Four collaborative events for practice representatives to learn and share knowledge and spread good practice, with expert speakers, seminars on identified topics, resources to share, and peer learning activities. Provide access to an online platform for tracking improvement activities, discussions and sharing resources. Baseline survey carried out by practices at the start of the programme. Qualitative information gathered at baseline meetings with practices and project team members. Demographic data on practices’ populations, CQC inspections, QOF achievement, and patient feedback gathered through publically available information. Evaluation forms completed by participants at collaborative events. Aggregate data from each practice’s culture survey. Follow-up survey carried out at completion of Cohort 1 of the programme. Semi-structured interviews with practices that had completed the follow-up survey. Database of timescales for survey activities held by project team. Practices stated their key learning was around the importance of culture, and language. The importance of involving the wider team, understanding human factors, and learning from near-misses were also highlighted by participants. CCG participants valued the networking and learning from the collaborative. Some practices could identify practical changes they had made because of being involved in the collaborative, using techniques and approaches discussed in the learning and sharing events. Other practices found reassurance that their culture and ways of working were already effective. Overall 11/14 participants in cohort 1 rated the collaborative as good or very good, with 11/13 for organisation and 10/13 for being kept informed. 549 staff were surveyed across 12/14 practices through the collaborative. Target response rate = 60%. The median response rate was 52%-87%. In total there were 333 respondents in Cohort 1. 110 staff received facilitated debrief (5/12 practices who completed survey). 453 staff were surveyed in Cohort 2 with a 72% response rate. 8/14 practices received a facilitated debrief. Many practices identified they had made changes to communication and team involvement because of the survey and debrief process. When interviewed, participants stated they had made several small changes and involved all members of staff. Some participants felt they wanted to do more, but were currently restricted by time and work load/pressures. Our project has identified that a collaborative model can work in the primary care setting, and the successful elements of this are well-organised events with expert speakers, use of a safety culture assessment process, and opportunity for peer-to-peer learning and sharing. Given the wider context and issues with workload and time for practice leadership teams, we suggest the timescales of primary care collaboratives should be considered as the start of an ongoing process of improvement, rather than a nine-month project. Although an online platform and online resources were provided, these were the least well used and least valued elements of the intervention. Barriers included awareness, time to access, and usability. As a result, prior to Cohort 2 the online resources were completely redesigned, to separate resources by time as well as making stronger links to the domains in the culture survey, and make the design of the page more visually engaging. The strengths of the project were the one-to-one relationships built between the project leads and practices. However, the project lead identified that this individualisation took time and therefore this may affect capacity for spread and increasing scale. Having a strong clinical lead, engaged with the programme and in contact with participants both face-to-face and phone was also a contributory factor in success, along with the advice and involvement of members of the steering group. The project lead found the input and advice from steering group members valuable, and practice participants also valued having commissioner representatives at the events. In Cohort 1 the culture survey was outsourced. Due to issues with timeliness of surveys being sent out and debrief reports returned, the momentum of the collaborative was affected. In Cohort 2 the survey process was brought in-house. This meant that turnaround timescales were much quicker (in one practice the whole process from initial meeting to debrief took 1 month), however this placed a capacity pressure on the project facilitator. The third event in the series in November was poorly attended in both cohorts, although there was good attendance at the final event in both cohorts. Therefore, three rather than four events may be sufficient. All debriefs were led by one member of the Patient Safety team with support from the clinical lead and CCGs as appropriate. Resources to support culture survey debriefings are being prepared by South West AHSN as part of the national Culture & Leadership workstream and this will be beneficial to support others to carry out these activities. The main reason for not proceeding after expressing an interest was the timing of the activities in relation to other pressures, e.g. practice mergers, moves or CQC inspections. Being more flexible in Cohort 2 enabled practices to join later in the process. Attempts to set up action learning sets in locality areas were unsuccessful. If we were doing this again, we would add in a pre-assessment to see if the collaborative will suit the practice and be of value. Options for spreading the learning and encouraging adoption are being scoped in collaboration with key stakeholders from the Primary Care Collaborative steering group.